Roses, roses all the way! It's the annual spring rush of my favorite flower in fragrance. I've recently reviewed L'Artisan Parfumeur Rose Privée and Aerin Rose de Grasse, and today I'm taking a close sniff of Maison Francis Kurkdjian's À la Rose. Yes, it's another "ode to femininity," another homage to the rose fields of Grasse, another pink juice...but I'm still not tired of roses, so onwards we go. Like Parfums DelRae's Coup de Foudre, À la Rose is a sheer, well-made rose soliflore in an elegant modern bottle. It opens with a burst of sweet-tart bergamot before it segues into its rosy and, yes, "radiant" floral heart. If these roses evoke a garden, it's a carefully cultivated one (like Marie-Antoinette's gardens at Versailles? ); if they suggest a florist's shop, it's an uptown florist that imports high-quality blooms. The magnolia note helps to keep everything light and youthful; I don't detect any violet. À la Rose gradually deepens and warms just a tiny bit, into a base of very sheer woods and moss. The dry down is not terribly distinctive, and it makes me miss the roses of the composition's earlier phases. I've heard that À la Rose was created with the Japanese market in mind, and that makes some sense. 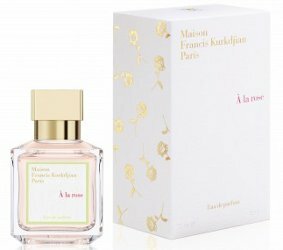 It could also serve as a "gateway" fragrance for women who are just starting to explore Maison Francis Kurkdjian and aren't quite ready for some of the line's richer scents (although they could also give Amyris or Féminin Pluriel a try). It's very pretty, very fresh and bright, and surprisingly long-lasting. It just doesn't capture my imagination as much as some of Maison Francis Kurkdjian's other scents. In conclusion: I like À la Rose more than Aerin Rose de Grasse and last year's Acqua di Parma Rosa Nobile, although not quite as much as L'Artisan Parfumeur Rose Privée. If I had about $250 to spend right now (! ), I'd rather acquire a more distinctive rose from Frédéric Malle or Serge Lutens, or a bottle of Kurkdjian's earlier creation MDCI Rose de Siwa, a beautiful feminine rose that appeals even more to me, thanks to its powdery violet and hawthorn notes. 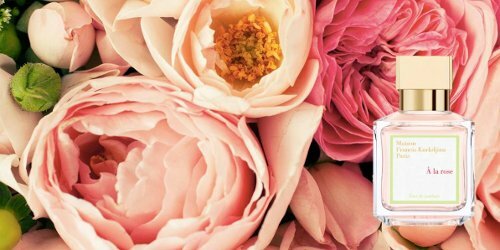 Do you have a favorite pick from early 2015's crop of rose perfumes? Feel free to share in the comments. Maison Francis Kurkdjian À la Rose is available as 70 ml Eau de Parfum ($245). For purchasing information, see the listing for Maison Francis Kurkdjian under Perfume Houses. Ah, so excited to read your take–I sniffed this last week and felt like, surely for $245, there must be more to it than I was noticing! Relieved to hear that I’m not the only one who felt like there was maybe not as much “there there” as one might like for the money. Two more Qs that have been on my mind–I’d be interested to hear how you think it compares to Eau Rose? I thought the top notes were pretty similar but I didn’t make it far enough into the drydown to get a good sense (had competing scents on each wrist and decided it was nicer to my dinner companions if I washed off one!) And then I’m also curious to hear whether you noticed any of the pear and lychee that weren’t in the original notes, but did make the cut for the promo video ( https://nstperfume.com/2015/02/04/a-la-rose/ ). They must have also been in the instructions to SAs, as the one who helped me was eager to mention them; can’t say I could much smell them even when pointed out tho. Maybe fruit is just invoked to reassure the wary that the scent is “modern”? Hi, C.H.! No, I don’t *think* you were missing anything… Maybe I’m just getting old and cranky, but I remember being able to buy Crabtree & Evelyn’s Rose for next-to-nothing back in the 90s, so I hesitate to pay so much for a pretty rose solifore nowadays. I prefer Diptyque’s Eau Rose, not only because of the lower price and prettier bottle, but because it seems a touch fruitier and a little more rounded to me. Speaking of fruit, I could agree that there’s a hint of pear in the MFK A la Rose, but nothing lychee-like or otherwise tropical-fruity. Just the citrus! WHAT. I saw some new shampoo bars in my local LUSH last week, but I don’t remember a rosey one!! I must swing by there to night to check again. Thank you, Jonas! No problem. They’ve released six new ones. I’m planning to get Copperhead which shares its scent with their Dear John perfume: coffee and vetiver. Wouldn’t it be easier if they had a unified making scheme? Jason and the Argan Oil is a fun name but I think just calling it Rose Jam shampoo bar would have been a lot more helpful. If anyone remembers Pruning Shears by Demeter, Kurkdjian is the perfumer for that scent – a metallic, very realistic rose scent. And I also do remember him being involved with some outdoor scent-installation where a whole area was saturated with the scent of roses, from a rose fragrance he created just for the event. And didn’t he also do Rose Barbare by Guerlain? I must admit, this scent doesn’t sound like my type of scent at all. I’ll stay with my rose oud oils, Sa Majeste la Rose & Rose 31. I want to try pruning shears so badly. Loblaws used to carry the entire Demeter line in Canada but it looks like they no longer do. Oh well. I think you’re better off sticking with Rose Barbare in this case! His outdoor scent-installations do sound really magical. He also did Ferre Rose, which is a remarkably sheer and still “there” light fruity rose. Very sunny, very summertime, not insipid, but different. There is a watermelon note in that one that is very intersting and unusual. It makes a watery kind of accord that smells wet, but not aquatic. I have stayed away from the Kurkdjian line simply due to their outrageous costs but I did smell the Le Pluriel’s on a scent strip randomly if I remember correctly. I do need a good rose though to layer with. I’m sometimes tempted by the APOM Femme elixir (in little roll-ons), and I do love the incense burning papers and have bought them in the past! I’m a sucker for designer incense, so will check them out. I have a sample of this one, and I actually like its fresh, pink roses, but ouch! The price! It reminds me of Delrae’s Coup de Foudre which costs significantly less. Elizabeth, I’m guessing it would be a nice splurge for someone who doesn’t already own a sheer, fresh rose and who is attracted to the brand’s overall style (and who has the cash! )… but you’re right: there are other high-quality rose soliflores or near-soliflores out there for less! I like Coup de Foudre, but not enough to buy it since I already have scores of roses. I wish I am able to test all the recent releases b/c I do like roses. The only one I got my hands on was the Aerin Lauder Evening Rose, which I liked, but I had musk anosmia issues with it, and I suppose that came out before 2014? I would love the smell the AdP rose, et. al, and eventually I’m sure they’ll cross my path. Regardless of what I might think about these, since I’m a rose lover, I am just happy that roses have their proper place in modern perfumery and marketplace, and aren’t treated like a pariah they were for a long while. AnnS, that’s so true. If somebody tries one rose fragrance and realizes that she likes roses after all, she might try more and more rose perfumes… and then she ends up like me. The more rose fragrances, the merrier! Thanks for this review! How does A La Rose compare to MFK’s Lumiere Noir Pour Femme? For me at least, the difference is night and day. Haha–I guess they do make good day/night alternatives. But mainly, they don’t smell anything alike. One’s a light citrus rose scent and the other’s a dark, sultry patchouli bomb (…which I mean as a total compliment. I much prefer Lumiere Noire Pour Femme.) If you find Lumiere Noire to be coming on way too strong, you might like this; but if you love Lum Noire, well, I know I found this a bit of a let-down. Oh, I agree! They’re 180 degrees apart. I admire Lumiere Noire (and Cologne pour le Soir), but I can’t pull them off. They’re so potent!! A la Rose is fresh and delicate and office-friendly, not a sexxxaaay night-out fragrance at all. Ooh, good to know. I love and own Lumiere Noir, but agree that you have to be in the right frame of mind/situation to wear it. Having said that, it does seem to garner compliments whenever I do wear it. Ce Soir Jamais (Annick Goutal) is another “jammy” type rose. Rose Jam is all sorts of gorgeousness and yum! They have a permanent Rose Jam fragrance shampoo bar at Lush! Also a body conditioner (Ro’s Argan Body Conditioner) with the exact same smell so hopefully that will do the trick! Yes to all of this — layer the body conditioner and the shower gel and the shampoo bar in the shower, then use their new Pearl Massage Bar as a lotion (it has the Rose Jam scent!). Lush did offer a Rose Jam perfume as a limited edition. You may be able to track it down on eBay, etc. I don’t know of a rose perfume that’s identical, otherwise, but a few that you might enjoy are Serge Lutens Une Fille de Berlin, Ava-Luxe Roses, and Van Cleer & Arpels Rose Velours (which I really should review someday). I put in an order, thank u all!!! I have the Rose Jam perfume and shower gel. Sun’s Eye Mystic Blends Love Drawing Oil is not a duplicate, but it is reminiscent of Rose Jam; costs ten bucks; and it brings me compliments from loved ones. I am a rose lover too, and have way too many rose perfumes. I love to wear Annick Goutal’s Rose Splendide and Rose Absolue, Parfums DelRae’s Coup De Foudre, Sonoma Scent Studio’s roses, and just recently I received Rose De Siwa for my anniversary. But the rose of 2015 that takes the cake is Chanel’s new Misia. Love, Love, Love! That’s a beautiful list of rose fragrances! Congratulations on the anniversary (and your new acquisition). Now I want to try Misia, too! Really? I heard Misia is all about the violet and Iris. My sample is on the way, looking forward to sniffing as I love rose too. thanks, elise! I will check it out! I actually got to try this rose when it was still a Japan exclusive! But I’ve got to say it was too transparent/ borderline plain for my taste.. It really fitted with the Japanese customer’s preferences though I think. That place is practically scentless and everyone tries not to offend anyone and very polite. I’ve heard this over and over about the Japanese market…interesting. In that case, it works perfectly!